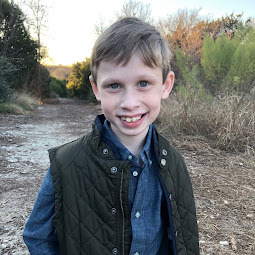 Bennett Brinson Gamel: Fighting Cystic Fibrosis: Rectal Prolapse...but this time it's good! Rectal Prolapse...but this time it's good! Today started out with a bit of a surprise. My mom, who is staying with Bennett, texted me that he had thrown up last night. Then, this morning, my mom called to let me know Bennett had a rectal prolapse episode. My heart sank. I feared the C.Diff. was back. But within a few minutes of getting off of the phone, I considered that maybe another issue might be causing his rectal prolapse: hypermotility of the gut (aka diarrhea). And then, it hit me...Bennett may be having diarrhea because of malabsorption. People with Cystic Fibrosis often deal with malabsorption, which is why they take enzymes to prevent this. Rectal prolapse is a common response of malabsorption. 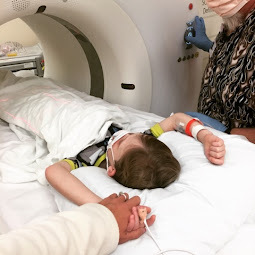 It occurred to me shortly after and was later confirmed by both the hospital doctor and dietitian that Bennett had been eating more food than enzymes he had been given. 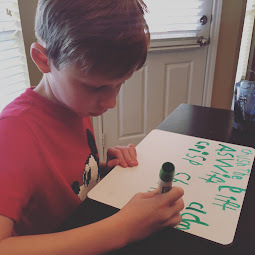 It was disappointing to think Bennett might be having malabsorption issues but it was thrilling to think he is eating so much that we couldn't keep up with him! 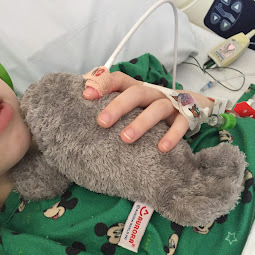 Immediately this morning, the dietitian changed his enzyme dose so that he is getting more enzymes per feeding. Bennett is getting about 1400 calories per day, anywhere between 20-50% more calories than another child his age. Kids with CF need more calories than other children. So, the Feeding Clinic is trying to pump him with lots of fat and calories to keep him healthy. Things are going extremely well with him, according to his "Feeders". Most kids at the Feeding Clinic gain about 5-6 ounces per day. Bennett is gaining an average of 20 ounces per day. This is excellent for a child who has never shown to gain much weight rapidly. On another note...We are stoked about our CF Walk tomorrow! A TON of work has been put into it so I am praying that all of it will come together. I have felt God's gentle touch to almost every single thing I tried to do regarding the walk. It has been wonderful to channel my feelings towards CF in a constructive way. I can't wait to see friends, new and old, tomorrow and enjoy one day out of the year where we can celebrate a cure will happen sometime soon. Lastly, I got my cast on today. Using crutches and wearing a cast is SO hard! Oh my goodness, I'm gonna have guns by the time this is over. My upper body strength is getting such a workout! I've been known to hop on one foot around the house or crawl on the floor in an effort to give my now bruised and sore armpits a break. 21.) I am thankful for only a 10% chance of rain for our walk tomorrow...down from a 50% only a few days ago. 22.) I am thankful for a dear friend who called this morning and asked if Oliver could tag along with he and his kids to a movie earlier this afternoon, giving Brian and I several hours break without any children. 23.) I am thankful for family who offered to help us out this weekend - my sister who traveled to be with us at the walk and my mom who is watching Bennett. 24.) I am thankful for an ankle that isn't hurting anymore...because it can't bend and is no longer being used.